(CBS) - One of the words often used to describe Denver quarterback Tim Tebow's impressive and exciting come-backs is "miraculous." In the eyes of many people, Tebow seems to be the focus of more miracles than any other NFL player. But does God really care who wins a football game? 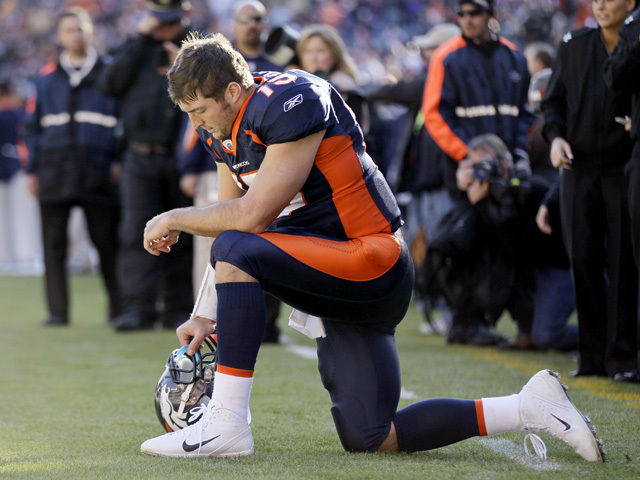 Does divine intervention play a part in Tim Tebow's game? According to a recent poll, 43 percent of people say it does. In a telephone survey conducted by Poll Position, 1,076 Americans who are familiar with the player were asked, "Do you believe that any of Tim Tebow's success can be attributed to Divine Intervention?" Forth-three percent of respondents said yes, 42 percent disagreed, and 14 percent expressed no opinion. For his part, Tebow has constantly maintained that he is just a player like anyone else. In an interview with "The NFL Today" host James Brown, Tebow said that just because someone might be blessed with superior athletic ability "doesn't mean God loves you more than anybody else." A devout Christian, Tebow has become a popular figure almost as much for his faith as for his abilities on the football field. During games, he can be seen praying on the sidelines and has gone on record many times on how his faith guides him. He is also a humble and self-effacing player. He told James Brown, "I think number one is, what my mom and dad preached to me when I was a little kid: Just because you may have athletic ability and you may be able to play a sport doesn't make you any more special than anybody else." But apparently many folks believe that Tebow truly is someone special. What do you think? Let us know in the poll and in the comments.